My first post on this blog was published August 21, 2011. So tomorrow is my first blogging anniversary. The first post was about a campaign called Blackwater Falls, which was one of the most successful games I have played in. That first effort has been followed by more than 300 others, and this blog has accumulated over 69k views; moderate success by the standards of our community, I think, but certainly way more than I expected! I had no intent when I began to produce anything so regular, and avoided the idea of a posting schedule intentionally, to keep fun high and pressure low. My only stricture was to try not to post more than once a day, to keep from flooding any potential readers and burning out my own enthusiasm (I have broken this rule once or twice, but only for minor things like links to other resources). Sometimes I wonder about the effort involved. Blogging is not hard, especially compared to more systematic writing, but it does require an investment of time to get ideas into a form that can be consumed by others. However, I have found that this is a good way to figure out what I actually think about something. My first post drafts, which were never actually published, focused on the design of Fourth Edition, as that was what pulled me back into the hobby after a 10 year hiatus. Well, the edition itself didn’t pull be back in, it was more that 4E was the game my coworkers were playing. So my earliest posts were focused on explaining the ideas of class balance, roles, and power sources to myself. As noted, those posts never actually got published, as I quickly realized that 4E catered primarily to aspects of the game that I wasn’t really interested in, despite having some innovative ideas (I still think, for example, that forced movement is something which could profitably be introduced to traditional D&D, without recourse to the grid or miniatures). By reading some blogs that focused on 4E, I discovered that other communities online existed dedicated to earlier styles of gaming, and slowly came to the realization that the OSR seemed to be more in line with my own priorities. 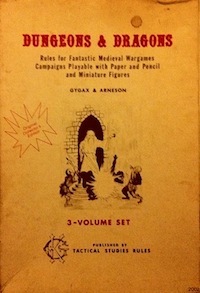 As it turned out, many of the gaming practices that worked best for me back in my days of 2E gaming were cases of independently discovering things that the original game was designed around, but that were gradually sidelined or eliminated in later editions (and hence largely concealed from me during the 90s). Despite that, I ran a hacked version of Fourth Edition D&D for something like 9 months, because the player interface was familiar to the people I was gaming with. It was fun. It gave me real experience regarding what “new school” D&D is good at, and what it is bad at. I’m glad, though, to be running and playing rule systems that are closer to my ideal now. Engaging with the OSR and general gaming community via reading other blogs and writing this blog has been a very effective way of learning about gaming, and I often think I should apply the same strategy to some of my other hobbies. Specifically, I am pretty serious about weight lifting and fitness, and I think that fits the community reinforcement patterns present in blogging very well. I’ve been planning on starting up a fitness blog for a while, but have been hung up on picking a name (something that is always hard for me). I don’t just want to use a nonsense word like I did for this blog! (The story behind this blog’s name is that untimately is how I always mistype ultimately.) I’m also fascinated by economic history. Also blog material? How many blogs can one profitably have? That quote about serving multiple masters (Matthew 6:24) from the Bible comes to mind. Blogging is also somewhat addictive. As fellow blogger Erik from the excellent blog/setting Wampus Country noted, the addiction of blogging comes from the continuous minor rewards of comment feedback. Should I be ashamed to admit that often the first thing I do in the morning when I wake up is to check my email to see if there have been any blog comments overnight? Intellectually, I know that comment volume is not a good quality metric. The kinds of posts that provoke the most comments are quite obviously not the best posts, looked at with any kind of objectivity. But that knowledge does not make the reward structure of our minds work differently. It’s the same thing that is behind slot machines and treasure drops in Diablo and World of Warcraft. Worth keeping in mind, I think. If I had a single piece of advice for other bloggers, it would be to use writing about specific things as a way to get at a general idea. This is not based on a sense that what I am doing is the right way to do it, but rather on what I like to read on other blogs. For example, the Dwimmermount actual play reports on Grognardia are so good because they are not really actual play reports (which, let’s face it, are almost universally boring to read and are only useful as a record of happenings). Instead, they are investigations into how the elements of old school roleplaying work, with a mix of theory and examples taken from the session. Go back and read them some time, especially in chronological order, to see what I mean. Good literary criticism uses reading a novel as a vehicle to say something independently interesting. Similarly with any kind of discourse. I don’t always live up to this ideal, but I try. So what do I see as the future of this blog? Well, I’m not sure. I keep thinking I should scale back my posts to a few per week rather than approximately daily, but then I worry that if I stop for a few days I may just never return. I would also like to occasionally delve into other games more deeply, especially Call of Cthulhu and early Warhammer Fantasy Roleplay, but I think I need to actually play them before I can do that. So I will probably keep on doing more or less what I have been doing. As my Vaults of Pahvelorn game continues, I would also like to start releasing some of my materials from that, along with continued musings on OD&D. In addition, I have several other larger gaming-related projects that I am working on. I don’t like to talk much about projects before there is really something there, but hopefully these will progress soon to a point where I can start to talk about them without feeling like I am discussing aspirations as opposed to actual things. This entry was posted in Uncategorized on August 20, 2012 by Necropraxis. My motivations for blogging are pretty similar to yours, to have a reason to write something daily and hopefully strengthen that muscle by flexing it regularly (see what I did there? pulling in the fitness analogy? gawd, I crack myself up!). I’m not sure, in the six months since I started, that it’s really working out that way, but I’m not at a loss for ideas yet, so I’ll keep plugging away. I check untimately regularly, so whatever it is you feel you’re doing, keep it up, ’cause it works. You say your numbers are pretty ‘moderate’, but as a new blogger, they seem stratospheric! I think I’ll keep it up though, it’s great fun and one of the unexpected benefits was opening myself up to a bunch of other writers who I would usually either not read or at all, or only casually take an interest in. The community of RPG bloggers, OSR or more modern is a great thing to be a part of. You created your blog only three days before I created mine. I look forward to your efforts with Call of Cthulhu! Congrats. I too love me some comments– blogging without getting comments is like cereal without milk, or milk without cereal, or something. I’ve also thought of starting a blog about a different subject I want to learn more about and am passionate about, but in that case I don’t think there is an audience to blog to, so never really gave it a try. Anyway, keep up the good work. What is your other interest? Just curious. It seems like just about every hobby or field has an Internet community now. Congratulations! Since your posts on it greatly inspired me, I hope OD&D is still going to be the main focus of your blog.